How did the Greeks' body image impact their fashion sense? As you probably know if you've done any research into ancient Greece, the Greeks seemed very comfortable with their bodies. Many ancient Greek sculptures portrayed naked men and women, like the famous Discobolus by Myron (see photo to the right). Greeks were obsessed with the human body-- a perfect, athletic human body, to be exact. Of course, the Greeks had many athletic competitions, the most famous of which was the Olympics. In the Olympics, the Greeks competed naked. So my question is: if the Greeks were so into the naked body, why weren't their clothes form-fitting? As you learned in the last post, the Greeks wore robes, which they draped in very flattering ways. Their robes were pinned at the shoulder (either one or both shoulders), and most Greeks did not cinch at the waist. The peplos, for example, was very boxy-- sort of like wearing a potato sack! This meant that you couldn't really tell how athletic or "fit" someone was if they were wearing clothes. Take a look at the image at the bottom to see what I mean. Do you think that makes sense? You would think a body-obsessed culture would have clothes that would show off the body. 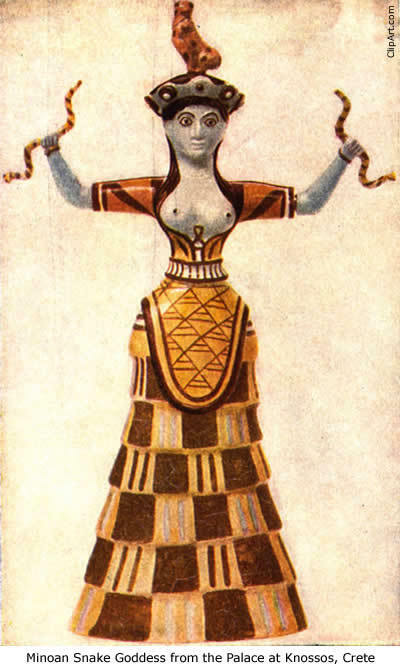 Interestingly enough, the Minoans, a civilization on the island of Crete (south of Greece) that arose in around 2000 BCE, used corsets to shape their bodies into an hourglass figure. You can see a sculpture of this here (but keep in mind before you click that ladies didn't censor their... err... chest-area). At a simple level, the weather in Greece was extremely hot, and in order to be comfortable, Greeks would need to have loose-fitting clothes. But I think it might go deeper than this. Perhaps the Greeks were so obsessed with having the PERFECT body, that they wanted to cover up imperfections with loose-fitting clothes. The Greek clothing was so well-draped that it made all figures look beautiful. This is just my interpretation-- I could be wrong. What do you think? I got most of this information from a really fun book called The Fashion Book by DK Publishing, which I borrowed from the art teacher Ms. Zachman. You can buy it on Amazon. I also read a website called "Naked Perfection" from PBS. Hi guys. I'm Ms. Barry! I teach 6th grade social studies at a private school in LA. This page will serve as an example for my 6th graders about how to write a good research blog.